documents nine Swedish ecovillages where residents express a profound satisfaction with their community and its accomplishments without losing sight of the challenges these communities must strive to overcome. It shares the residents’ thoughts on the successes and failures of their community. 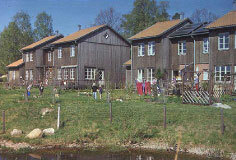 Examples of design, planning, and social issues help illustrate how the ecovillage model can be applied to a range of new and existing communities. Research for the text was sponsored by the Fulbright Commission and the Swedish University of Agricultural Sciences for the academic year of 1997-1998.